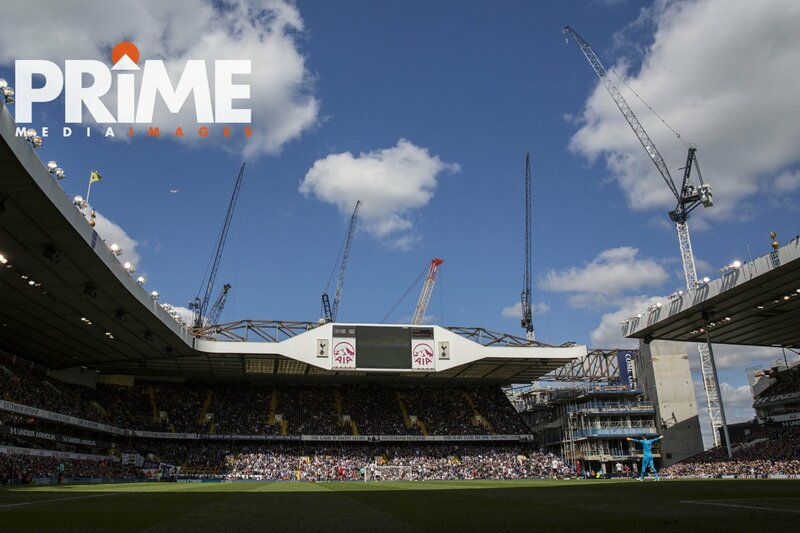 The final chapter of my White Hart Lane memories came on April 15th 2017 when I photographed the Premier League match between Tottenham Hotspur and AFC Bournemouth for Prime Media Images. I parked at a school next to the ground, attempted to stretch off part of the long drive, unpacked my kit and went for a wander. It was just before 10.30 ahead of a 12.30 kick off, overcast with a light chill in the air. Before heading into the ground I wanted to see the developing new ground next door, construction work in full swing. While the shape appeared impressive and highly promising, it was still tough to fast forward two years and imagine what it would look like finished and full and rocking with matchday sound. Construction work on the site of the new Tottenham ground ahead of the Premier League match between Tottenham Hotspur and Bournemouth at White Hart Lane, London, England on 15 April 2017. Photo by Mark Hawkins / PRiME Media Images. Walking through the site led to the familiar sights and sounds of the High Road buzzing with traffic, regular local life, red London buses and the first arriving supporters. High Road facing exterior of the new Tottenham Hotspur stadium ahead of the Premier League match between Tottenham Hotspur and Bournemouth at White Hart Lane, London, England on 15 April 2017. Photo by Mark Hawkins / PRiME Media Images. A gallery of historic Spurs images had been erected on the High Road-facing exterior and it was reassuring to see parents and kids enjoying the images, exciting to sense the future, hope and love of the club. The main entrance to White Hart Lane was unrecognisable from my earliest visits, autograph hunting and that time when I visited the players’ lounge. Buildings had been cleared away; it all felt temporary, clinical, deeply unromantic. Making my way down past the club shop and left onto Park Lane, the permanent fixture of the Burger vans and merchandise stalls, the smell of fried onions, burgers and grease. Left again, around the ground and back onto Worcester Avenue, the road I’d been led to from the car park. A steward pointed me towards the media entrance, a small door flap in a wooden gate. Despite visiting the ground many times as a fan, I felt that same newbie sense you get when visiting any ground for the first time as a photographer. I knocked uncertainly and the door opened and I stepped into the dark recesses of the East Stand lower tier. As at all Premier League grounds, you have your bags checked and tagged. Here I felt mildly awkward afterwards because I remained unsure which direction to go for the media or photographers’ room. The steward who’d checked my bags smiled and pointed a little vaguely. I found myself walking into a room of florescent jacketed St John’s Ambulance medics. Didn’t feel right. I retraced my steps and saw another photographer stepping into the ground. It turned out this was a Getty photographer shooting marketing images for Tottenham, and had only been to the ground once before himself. I was led along the back of the stand to another dark blue wooden door. Inside this one was a largish room already crammed full with photographers and equipment. A few people looked up. At my usual grounds there are familiar faces and you say hello once or twice. Here there was nobody. A few faces I recognised only from the internet, big newspaper or agency togs, people I might follow on Twitter or Instagram. Nobody I knew or who might know me. In such situations, instinct tells me to keep my head down. I made my way to the end space in a line of desks, manoeuvred my kit around an empty soup receptacle and unloaded the laptop. The ladies managing the accreditation desk were friendly and smiley. I was relieved to instantly see my face on their list and signed my name next to it before connecting to the WiFi. So far, so smooth. Stepping out into the stand and heading pitchside felt surreal, more surreal than any other professional ground where I’d photographed before. Because this was Spurs, Tottenham Hotspur, my team, the ground I’d visited as a fan more than any other from 1992 to 2012, the stadium I had most memories of, the ground I’d watched on television more than any other. Now I was allowed to walk around the perimeter of the pitch. Wasn’t I? Yes, of course. Idiot. But I had to act all cool and professional about it, like it wasn’t a big deal. NBC television pundit Phil Neville ahead of the Premier League match between Tottenham Hotspur and Bournemouth at White Hart Lane, London, England on 15 April 2017. Photo by Mark Hawkins / PRiME Media Images. There was Phil Neville, working for NBC, according to his lanyard. There was former Bournemouth and Tottenham player Darren Anderton, a real one-time hero. I lost count of the number of times I stuck up for him in the playground against Liverpool and Man United fans and felt personally validated when he scored in the 1998 World Cup. He probably wouldn’t remember me getting his autograph about twenty yards away from where we stood. Bournemouth manager Eddie Howe came out and warmly greeted him. I failed to get a decent frame, wiggling between all the other cameras and tripods. There was Jamie Redknapp and Thierry Henry, both looking handsome and expensive. Television punditry was probably a more lucrative game than sport photography. Another walk around the pitch perimeter in the other direction. The construction work in one corner of the pitch was ugly and unavoidable, like a big spot on someone’s cheek. General view ahead of the Premier League match between Tottenham Hotspur and Bournemouth at White Hart Lane, London, England on 15 April 2017. Photo by Mark Hawkins / PRiME Media Images. General view inside the ground including on-going construction work ahead of the Premier League match between Tottenham Hotspur and Bournemouth at White Hart Lane, London, England on 15 April 2017. Photo by Mark Hawkins / PRiME Media Images. At this point I became mildly troubled by the deep photographer pits. I had been warned about it but was still surprised. How on earth were you expected to comfortably shoot from down there, and use a laptop, with limited space amongst a bunch of other photographers? Were there any other places or did it have to be the pits? I spied another position near a corner flag and asked a steward who asked his boss who asked his boss who said no. I hunched down near some ad hoardings at the other end. There was probably a reason nobody else was there and I waited to be moved. Other togs glanced at me as they passed. One or two stopped and questioned me. “Why do you have no friends?” asked one well-spoken gent and I truthfully told him it was just how I’d lived life. It was clear it wouldn’t be acceptable to sit there and I would eventually be moved if I stayed put. Once resigned to this, kick off was only around half an hour away and most pits were full up. The only one that wasn’t was the South West corner, on the border of home and away fans. There was comfortable enough space there. It would do. Fidgeting into a semi-comfortable shooting position I exchanged a few words with another tog to my left, an open cheerful chap with a wide grin. I assumed by his immaculate looking kit that he was a big agency or newspaper photographer. “They should get a new stadium or something!” I quipped. We exchanged weak smiles, looked down at our cameras and away. A sign said photographers in this pit couldn’t photograph the managers at kick off. We had to stay put. “Did you read the instructions?” asked the tog who’d questioned why I had no friends, and I confessed not fully. He chuckled and later sat down in the pit ahead of kick off with a paperback novel: not common football photographer behaviour. I’d wanted to get in Pochettino’s face again. My images of him a couple of weeks earlier at Swansea had been so-so. But it was one less thing to panic over and I was settled now. Kyle Walker of Tottenham Hotspur ahead of the Premier League match between Tottenham Hotspur and Bournemouth at White Hart Lane, London, England on 15 April 2017. Photo by Mark Hawkins / PRiME Media Images. Being so low in the pit, beneath pitch level, gave an unusual aspect on the action for me. It was easier to achieve those prized mid-air shots. There was something more dynamic and involved about the level. Harry Kane of Tottenham Hotspur (right) and Charlie Daniels of Bournemouth during the Premier League match between Tottenham Hotspur and Bournemouth at White Hart Lane, London, England on 15 April 2017. Photo by Mark Hawkins / PRiME Media Images. Dele Alli leaps between two Bournemouth defenders during the Premier League match between Tottenham Hotspur and Bournemouth at White Hart Lane, London, England on 15 April 2017. Photo by Mark Hawkins / PRiME Media Images. Dembele, Kane and Eriksen all went close with efforts before Mousa Dembele opened the scoring. Dembele is an immense physical presence appreciated best at pitch level. He dominated the midfield for large parts of the game. Mousa Dembele of Tottenham Hotspur scores his side’s first goal during the Premier League match between Tottenham Hotspur and Bournemouth at White Hart Lane, London, England on 15 April 2017. Photo by Mark Hawkins / PRiME Media Images. Mousa Dembele of Tottenham Hotspur (second left) celebrates scoring his side’s first goal during the Premier League match between Tottenham Hotspur and Bournemouth at White Hart Lane, London, England on 15 April 2017. Photo by Mark Hawkins / PRiME Media Images. Spurs looked in firm control from start to finish. Soon after Dembele’s opener Son Heung-Min added a second. Son plays, behaves and celebrates in a refreshingly un-self-conscious manner. From the elaborate hand celebrations which Kane appeared to be indulging, to the way he impulsively ran thirty yards to leap on Vicent Janssen in celebration of Janssen’s late goal, he seems utterly unfazed by the spotlight of being a Premier League footballer. Everything he does, it seems like he would do in front of nobody at all, let alone 36,000 spectators and millions on television. He never tries to be cool and probably wouldn’t know how, except when he’s inside the box with the ball at his feet. He’d be overlooked in an quick roll call of star names come the end of the season, but deputised brilliantly for the injured Kane when called upon this season and has performed well wherever he’s been asked to play. Heung-Min Son scores his side’s second goal during the Premier League match between Tottenham Hotspur and Bournemouth at White Hart Lane, London, England on 15 April 2017. Photo by Mark Hawkins / PRiME Media Images. Son Heung-Min of Tottenham Hotspur celebrates scoring his side’s second goal during the Premier League match between Tottenham Hotspur and Bournemouth at White Hart Lane, London, England on 15 April 2017. Photo by Mark Hawkins / PRiME Media Images. Son Heung-Min of Tottenham Hotspur celebrates scoring his side’s second goal with Harry Kane during the Premier League match between Tottenham Hotspur and Bournemouth at White Hart Lane, London, England on 15 April 2017. Photo by Mark Hawkins / PRiME Media Images. Thankfully, both of the first half goal celebrations came to our corner of the pitch. I didn’t consider moving at half time, as space down the other end was bound to be uncomfortably tight. Bournemouth didn’t look like mounting a comeback. Indeed, Kane scored early in the second half. Harry Kane of Tottenham Hotspur celebrates scoring his side’s third goal during the Premier League match between Tottenham Hotspur and Bournemouth at White Hart Lane, London, England on 15 April 2017. Photo by Mark Hawkins / PRiME Media Images. Little of note happened at our end of the pitch in the second half, but it offered the chance to get general views of the developing ground, as well as our defenders. The Belgian boys Jan Vertonghen and Toby Alderweirheld together with French goalkeeper Hugo Lloris had formed the bedrock of our impressive defensive record at home. General view during the Premier League match between Tottenham Hotspur and Bournemouth at White Hart Lane, London, England on 15 April 2017. Photo by Mark Hawkins / PRiME Media Images. Jan Vertonghen of Tottenham Hotspur clears away Joshua King of Bournemouth from during the Premier League match between Tottenham Hotspur and Bournemouth at White Hart Lane, London, England on 15 April 2017. Photo by Mark Hawkins / PRiME Media Images. Jan Vertonhgen of Tottenham Hotspur chews gum during the Premier League match between Tottenham Hotspur and Bournemouth at White Hart Lane, London, England on 15 April 2017. Photo by Mark Hawkins / PRiME Media Images. Tottenham Hotspur manager Mauricio Pochettino watches his player Dele Alli battle with Jack Wilshere of Bournemouth during the Premier League match between Tottenham Hotspur and Bournemouth at White Hart Lane, London, England on 15 April 2017. Photo by Mark Hawkins / PRiME Media Images. Vincent Janssen of Tottenham Hotspur is congratulated by Son Heung-Min after scoring his side’s fourth goal during the Premier League match between Tottenham Hotspur and Bournemouth at White Hart Lane, London, England on 15 April 2017. Photo by Mark Hawkins / PRiME Media Images. At full time Tottenham manager Mauricio Pochettino thanked each player as they left the field. Another key component to recent form, Tottenham can only hope the ambitious Argentine is as happy and settled at the club as he appears. There was a sharp sentimental pang as I took a final walk around the perimeter and climbed the lower tier steps of the East Stand. I looked back one final time at the pitch, the banks of blue seats, players going through their warm-down routines, ran through a reel of memories in my head. Come now, I told myself, stay cool and professional. This looked like being it then, for me and White Hart Lane: the final memory. Photographing here at pitchside is something I would never have dreamed I’d do when first visiting with my Dad, aged 12. My 12-year old self at least would be proud of me. And photographing a comfortable 4-0 win to maintain our pressure on the league leaders, it wasn’t a bad way to end. All images copyright of Prime Media Images Ltd. View more and licence images for editorial use via Prime Media Images.